Marc Glosserman, the proprietor of Hill Country restaurants, has turned his downtown Brooklyn barbecue spot into a food hall called Hill Country Food Park. The all-day space offers coffee and Du's donuts in the early hours, fried chicken, tamales and square pizza for lunch, and baby-back ribs and cocktails at night. Breakfast, Lunch & Dinner daily. Hill Country Food Park, 345 Adams St., Brooklyn, NY 11201, 718-885-4608. The Water Tower, a bar and lounge in Brooklyn's The Williamsburg Hotel, looks like a classic New York City water tank, wrapped in glass. The 45-seat spot offers a number of selections for bottle service, cocktails and Champagne. Snacks include oysters, Wagyu steak tartare and chicken croquettes. The Water Tower, The Williamsburg Hotel, 96 Wythe Ave., Brooklyn, NY 11249, 718-362-8100. From the team behind Babbalucci comes Harlem's pizza spot Bar 314. In addition to the pies, also on offer (brunch only) are pucce, a Southern Italian sandwich made with pizza dough as bread, and small plates like fried burrata with hot honey. Bar 314, 1260 Amsterdam Ave., New York, NY 10027, 646-682-7645. Taladwat in Hell's Kitchen celebrates the food of the Thai countryside. The menu includes dishes like winter melon soup, turmeric curry chicken, braised short rib and fried whole butterfish. Lunch & Dinner daily. Taladwat, 714 9th Ave., New York, NY 10019, 646-823-9815. Shoo Shoo channels Tel Aviv’s café culture in NYC's NoLIta. The restaurant, open for dinner and brunch, serves dishes like gluten-free falafel latkes, grilled steak with chermoula sauce, and an herb frittata with green labne. Shoo Shoo, 371 Broome St., New York, NY 10013, 646-590-6800. Will Durollari and his sons Arben and Kuj Durollari own Nittis, an Italian-American restaurant in Hell's Kitchen. Andrea Cinus Napolitano, who comes from Rome, helms the kitchen, which cooks up dishes like bucatini pomodoro and short rib polenta soufflé. Lunch & Dinner daily. Nittis, 523 9th Ave., New York, NY 10018, 212-517-0939. At Farm to Burger, the name says it all. This casual restaurant at the Aliz Hotel Times Square features burgers and other simple farm-to-table fare. Yves Jadot and Alberto Benenati run the spot. Breakfast, Lunch & Dinner daily. Farm to Burger, Aliz Hotel Times Square, 310 W. 40th St., New York, NY 10018, 646-609-5122. Atlas Kitchen on the Upper West Side offers familiar Chinese dishes like dan dan noodles, and more adventurous choices such as spicy duck tongue and chicken feet with two spices. Marble tabletops and a mural of mountains by the artist Qiu Anxiong make for an attractive, inviting space. Lunch & Dinner daily. Atlas Kitchen, 258 W. 109th St., New York, NY 10025, 646-928-0522. David Chang’s Momofuku Noodle Bar has a second location uptown at Columbus Circle, with a different menu than the original East Village restaurant. His signature ramen is on offer, with brisket and water spinach or pork belly and egg yolk, as are homemade breads, crudo and veggies. Lunch & Dinner daily. Momofuku Noodle Bar Columbus Circle, The Shops at Columbus Circle, 10 Columbus Circle, 3rd Fl., New York, NY 10019, 646-918-8752. Union Square Hospitality Group is behind Intersect by Lexus, the café and restaurant owned by Lexus (yes, the car company). Gregory Marchand, a French celebrity chef with restaurants in Paris and London, helms the kitchen. The ground floor café makes way to a restaurant and cocktail lounge upstairs. The restaurant will unveil a new concept every four to six months. Breakfast, Lunch & Dinner daily. Intersect by Lexus, 412 W. 14th St., New York, NY 10014, no phone. Fava Bistro, a two-story Mediterranean restaurant, showcases the flavors of Greece. Its menu includes garlicky tzatziki, house-made merguez sausage, and branzino with lemon relish and crispy capers. Fava Bistro, 74 Seventh Avenue S., New York, NY 10011, 212-776-9965. Oliver Zabar, the grandson of the owner of the iconic Jewish grocery store Zabar’s and the son of Eli Zabar, has opened Devon, a restaurant and cocktail bar, on the Lower East Side. The menu features a chicken au jus sandwich, grilled octopus, lamb meatballs and steak tartare. Josh Blum, who worked at Aquavit and Betony, runs the kitchen. Dinner nightly. Devon, 252 Broome St., New York, NY 10002, 212-427-3997. Jonathan Benno, who helmed the kitchens at Per Se and Lincoln Ristorante, now has his own restaurant: Benno in the restored The Evelyn hotel (located past his more laid back Leonelli Taberna). The restaurant celebrates the food of Liguria and Provence, with a dining room furnished in original walnut woodwork and mosaic floors. Benno, The Evelyn, 7 E. 27th St., New York, NY 10016, 212-451-9557. Restaurateur Jimmy Rizvi and chef Gurpreet Singh are behind GupShup, the new Bombay-inspired restaurant and cocktail bar in Gramercy. Their signature dishes include pumpkin with roasted tellicherry peppers, and tomato rasam ramen with mushrooms. Dinner nightly. GupShup, 115 E. 18th St., New York, NY 10003, 212-518-7313. Oath Pizza on the Upper West Side offers various pies that feature produce grown in its on-site hydroponic garden. The "Muffled Trushroom" is topped with house-made truffle sauce, roasted mushrooms and Grana Padano cheese. Classic pizzas like pepperoni and sausage are also available. Lunch & Dinner daily. Oath Pizza, 2169 Broadway, New York, NY 10024, 917-388-2829. Upper East Side Thai restaurant Maison Bangkok has a bright, all-pink dining room, where dishes like avocado mango salad, noodles, curries, and quail eggs wrapped in wontons are served. Lunch & Dinner daily. Maison Bangkok, 355 E. 78 St., New York, NY 10075, 212-628-4442. The latest addition to David Chang’s restaurant empire is Bang Bar, a takeout breakfast and lunch spot on the third floor of Time Warner Center. The place takes its name from ppang or bbang, which means bread in Korean. Featured are flatbread wraps stuffed with spit-roasted meat, like spicy gochujang-marinated pork shoulder. Bang Bar, Time Warner Center, 10 Columbus Cir., New York, NY 10019, no phone. Amy Scherber and her husband, Troy Rohne, have opened up their first Brooklyn outpost of Amy's Bread in Brooklyn Heights. The 24-seat café serves bread, pastries, sandwiches and coffee. There are also locations of the bakery in Hell's Kitchen and the Village. Breakfast & Lunch daily. Amy's Bread Brooklyn, 311 Henry St., Brooklyn, NY 11201, 929-276-3108. Katie Rue's 26-seat Reception Bar on the Lower East Side features cocktails based on Korean spirits, especially soju. On offer is a drink called the Lotus Breeze, mixed with lotus-infused soju, sparkling chrysanthemum tea and green plum syrup. Reception Bar, 45 Orchard St., New York, NY 10002, 646-490-4053. 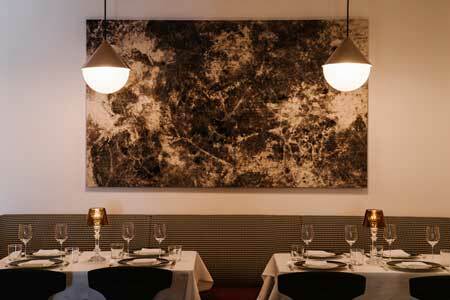 In the former Dovetail space on the Upper West Side, Adam Leonti's eponymous Leonti restaurant showcases elegant yet simple Italian dishes, like salt-encrusted branzino, veal tartare, and sage cannoli for dessert. 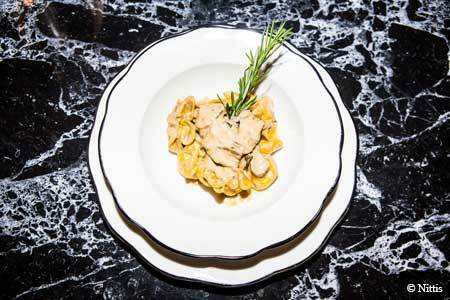 The restaurant mills its own grains for its house-made breads and pastas. Dinner nightly. Leonti, 103 W. 77th St., New York, NY 10024, 212-362-3800. Unagi, or freshwater eel, is the star of the show at Unagi-Ya Hachibei, a Japanese restaurant in an intimate townhouse dining room decorated with black walls and red curtains. The delicacy is served grilled and brushed with a sauce from Kyushu, an island in southwestern Japan. Lunch & Dinner daily. Unagi-Ya Hachibei, 238 E. 53rd St., 2nd Fl., New York, NY 10022, 212-888-8003.